(Phys.org)—A team of researchers from the U.K. and Australia has published a paper in the journal Earth and Planetary Science Letters, suggesting that the crater Chicxulub, off the coast of Mexico, may have come about due to the impact of binary asteroids (those that travel in pairs), rather than just a single one. The crater is thought by many scientists to be evidence of an asteroid strike that led to the extinction of the dinosaurs. Binary asteroids are not wholly uncommon – space scientists estimate that as many as 15 percent of those observable are binaries. This observation has caused scientists problems though, due to the dearth of evidence of binaries striking the Earth – as few as 2 to 4 percent. In this new research, the team, led by Katarina Miljkovic, suggests that many of the craters evident on the surface of the Earth, and believed to have been caused by a single asteroid, may in fact have been caused by binaries. They say that a binary could cause just one crater if the two asteroids were close enough together when they struck. They suggest such craters would likely have a peanut shape, or have one side distorted. The team came to these conclusions after building computer simulations that showed asteroids hitting the earth. Some of the craters that resulted were oblong, or irregularly shaped, which they say, means the same could be true of real craters here on Earth. They point to Chicxulub as one such example, which many scientists believe is the scar left behind by an asteroid strike so violent it caused the demise of the dinosaurs. They note that the crater has some asymmetries that could be explained by a binary strike. If that were the case, they further suggest it likely that the combined size of the asteroid would have been roughly the same as the calculated size of a single entity – namely a combined diameter of 7 to 10 km. The crater left behind has a diameter of approximately 180 km, which means, the researchers say, that twin asteroids could have been as far apart as 80 km and still produced a single crater. The researchers suggest scientists will have to take a new look at other existing craters to try to determine if they too are possibly the result of binary strikes and if so, recalculate their number. Likewise, other scientists might also begin to ponder the doubly hard problem of preventing future binaries from striking the planet. Observational data show that in the Near Earth Asteroid (NEA) region 15% of asteroids are binary. However, the observed number of plausible doublet craters is 2–4% on Earth and 2–3% on Mars. This discrepancy between the percentage of binary asteroids and doublets on Earth and Mars may imply that not all binary systems form a clearly distinguishable doublet crater owing to insufficient separation between the binary components at the point of impact. 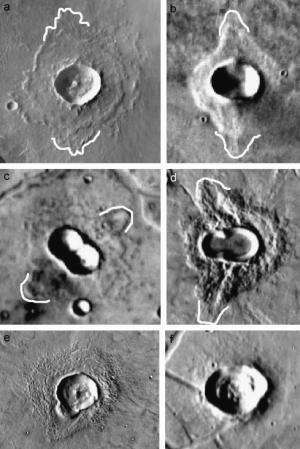 We simulate the crater morphology formed in close binary asteroid impacts in a planetary environment and the range of possible crater morphologies includes: single (circular or elliptical) craters, overlapping (tear-drop or peanut shaped) craters, as well as clearly distinct, doublet craters. While the majority of binary asteroids impacting Earth or Mars should form a single, circular crater, about one in four are expected to form elongated or overlapping impact craters and one in six are expected to be doublets. This implies that doublets are formed in approximately 2% of all asteroid impacts on Earth and that elongated or overlapping binary impact craters are under-represented in the terrestrial crater record. The classification of a complete range of binary asteroid impact crater structures provides a template for binary asteroid impact crater morphologies, which can help in identifying planetary surface features observed by remote sensing.